Who invented the Pencil? Nicolas-Jacques Conte (1755 - 1805) is credited with inventing the modern wooden Pencil, a rod of graphite encased in wood, in 1795. The Discovery of Graphite: Graphite was discovered in the early 1500's. The material graphite was believed to be a form of black lead, rather than a form of carbon, so graphite was called "plumbago", which is derived from "plumbum", which is Latin for "lead". The earliest known description of a black 'lead' writing implement dates from a 1565 book called 'On Fossil Objects' by Conrad Gessner that describes a black 'lead' point inserted into a wooden handle. Definition of the Pencil: The modern Pencil is defined as a thin cylindrical pointed writing tool made from a strip of black graphite encased in a small wooden rod. The pencil is sharpened to a point and used for writing and drawing. Fact 1: Who invented the Pencil? The modern, wooden graphite pencil was invented by Nicolas-Jacques Conte in 1795 during the Industrial Revolution era of inventions (1700 - 1860). Fact 2: Who invented the Pencil? Prior to the invention of the wooden graphite pencil in 1795, there were a variety of ancient writing implements and materials. The paint brush was used in prehistoric times before writing was invented. Paints and inks were independently discovered and formulated by all of the ancient civilizations but their writing implements differed according to their writing materials. Fact 3: Who invented the Pencil? The Mesopotamians invented the Stylus, an ancient writing tool, c. 2900 BC. The stylus was made from a reed and used by scribes in ancient Mesopotamia to make wedge shaped symbols on the clay tablets they used for writing. Fact 4: Who invented the Pencil? The Greeks, Romans and monks in the Dark Ages also used a metal or bone stylus on their 'reed pens' for writing on papyrus, parchment or vellum. Fact 5: Who invented the Pencil? The Chinese used an ink brush for writing. Brush pens were commonly made with bamboo handles and the brush head was made from a variety of different types of animal hair. The Ancient Chinese invented paper c. 100 BC but their invention did not reach Europe until 1150. Fact 6: Who invented the Pencil? In Europe the reed pens were replaced by the quill pen, a writing implement that was made from the wing feathers of birds. The hollow shaft of the feather, called the calamus, acted as an ink reservoir. Fact 7: Who invented the Pencil? 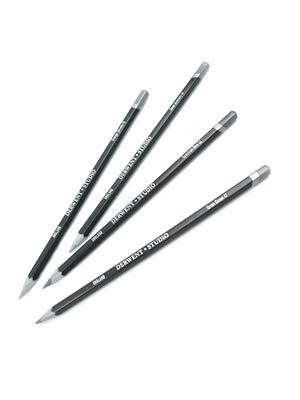 The discovery of graphite led to the invention of the modern pencil. The word 'pencil' derives from the Old French word 'pincel' meaning "artist's paintbrush". Fact 8: Who invented the Pencil? Graphite is a rare, naturally occurring, black, crystalline form of carbon that was discovered in England during the early 1500's. A large graphite deposit was discovered at Seathwaite in the valley of Borrowdale, Cumbria in the English Lake District. According to local legend a fierce storm in Borrowdale uprooted a large oak tree and farmers discovered a strange black substance clinging to its roots. Fact 9: Who invented the Pencil? The local shepherds found the black substance useful for marking their sheep, The locals called the graphite by the Old English word "wad" meaning 'woad' which was once used as an old dye. Another term they used was "black cawke" meaning "black chalk". Fact 10: Who invented the Pencil? The substance was solid and black, had a greasy feel and it left a mark upon your hands when rubbed. The locals cut the "wad" into a stick and carried it around wrapped in a bit of sheepskin. Fact 11: Who invented the Pencil? The idea for writing with "wad" was soon developed as people found it made excellent marks on paper. As its use spread to towns people began to wrap the sticks in twine, string, twigs or paper, and then began inserting them into a wooden handle. Fact 12: Who invented the Pencil? Two mines were established called the Upper and Lower Wadholes. The graphite at Borrowdale was the only large scale deposit of graphite ever found in its solid form. As the demand for the new writing material grew, so did its importance. Fact 13: Who invented the Pencil? Scientists frowned on using the colloquial terms of "wad" or "black cawke" for the newly discovered substance so they described it using different names including "black lead", "plumbago" and "black antimony". Fact 14: Who invented the Pencil? The early names given to the substance by the scientists explains the enduring and confusing term "lead pencil". Some believed the substance was a form of black lead, rather than a form of carbon, so graphite was called "plumbago", which was derived from the Latin word "plumbum" meaning "lead". Fact 15: Who invented the Pencil? Other Renaissance metallurgists first called graphite 'black antimony' a substance once used by ancient Egyptians for black eye make-up, commonly referred to as kohl. The earliest known description and illustration of a black 'lead' writing tool (pencil) dates from a 1565 book called 'On Fossil Objects' by Conrad Gessner. In his book Conrad Gessner said "The stylus shown below is made for writing, from a sort of lead (which I have heard the English call antimony), shaved to a point and inserted into a wooden handle". Fact 16: Who invented the Pencil? The word 'graphite' was not coined until 1789 when German mineralogist Abraham Gottlob Werner (1750-1817) invented the word from the Greek word 'graphein' meaning "to write". However, the association with lead and the pencil has stuck and is still often used today - even though the pencil has never contained lead! Fact 17: Who invented the Pencil? By 1610 the convenient little "black lead pencil" in its wooden holders were sold regularly in the streets in London and the graphite sticks were imported to Europe. The 'lead pencil' caused a sensation, especially among artists. The pencil was highly portable, could be easily shaped, sharpened to a point and could be used on just about anything. In addition the marks left by a pencil was erasable. Small pieces of white bread were used by to erase pencil marks so work could start over again. Fact 18: Who invented the Pencil? The graphite mines at Borrowdale strictly controlled the amounts mined yearly, giving England a monopoly on the substance. No one was able to find a second deposit of graphite that could be cut into sticks and used to make pencils. The substance was found elsewhere but only in a powder form that was no good for making pencils. Fact 19: Who invented the Pencil? In 1662 a man named Friedrich Staedtler invented a 'dry pencil' made of powdered graphite, wax and china clay. It could not match the quality of the Borrowdale graphite but it was much cheaper. The name of Staedtler is still known today as makers of fine writing instruments. Fact 20: Who invented the Pencil? The invention of the modern pencil is credited to Nicolas-Jacques Conte, a French artist and soldier. The French Revolution had erupted and in 1793 France declared war on Britain which resulted in a British blockade of French ports. Fact 21: Who invented the Pencil? It was impossible for the French to get graphite sticks from England so the artist and military man Nicolas-Jacques Conte was tasked with creating a substitute product. Fact 22: Who invented the Pencil? The inventor of the modern pencil, Nicolas-Jacques Conte, was born on August 4, 1755 in Aunou-sur-Orne, France and died on December 6, 1805. Fact 23: Who invented the Pencil? Nicolas-Jaques Conté was granted a patent in 1795 for his new formula of mixing powdered graphite with clay to make a pencil. He varied the proportions of clay to graphite which placed in a kiln fire and resulted in producing pencil leads of different, but uniform, degrees of blackness and hardness. The greater the clay element, the harder the pencil. His new pencils were encased in a cylinder of wood and his invention remains the basis for pencil making today. Fact 24: Who invented the Pencil? The famous octagonal and hexagonal shapes of the pencil were invented in 1812 by two American cabinet makers named William Monroe and Ebenezer Wood (1792 - 1880) who founded a factory in Concord Massachusetts which began the American pencil industry. Ebenezer Wood went on to automate the manufacture of pencils using machines. Fact 25: Who invented the Pencil? In 1847 Joseph Dixon (1799 - 1869) opened a pencil and crucible (container) factory in Jersey City, New Jersey. In 1866 Joseph Dixon patented a wood-planing machine capable of producing wood for 132 pencils per minute and produced the world’s first mass-produced pencils. Fact 26: Who invented the Pencil? In 1847 the Frenchman Therry des Estwaux first invented the manual pencil sharpener. In 1851 Walter K. Foster patented the first American pencil sharpener in 1851 (patent number US 12722), improving on Therry des Estwaux's pecil design and mass producing his invention. Fact 27: Who invented the Pencil? Hymen Lipman (March 20, 1817 – November 4, 1893) a stationer from Philadelphia, Pennsylvania is credited with registering the first patent for a pencil with a built-in eraser on March 30, 1858. Fact 28: Who invented the Pencil? By the end of the 1800's over 240,000 pencils were used each day in the US and completely replaced the old ink and quill pens. Fact 29: Who invented the Pencil? In 1890 the L. & C. Hardtmuth Company of the Czech Republic introduced the 'Koh-I-Noor' high quality pencil with a yellow casing. The pencil was so popular that many other manufacturers copied the color to make their pencils look like the high quality of their competitors. Yellow is the most popular outer pencil color in the world. Fact 30: Who invented the Pencil? The Koh-i-Noor Hardtmuth manufacturers are also credited with originated the HB standard of hardness gradations of the pencil. The letter H, indicating a hard pencil, stood for Hardtmuth, the letter B, indicating a softer pencil, for the company's location of Budejovice, and F, indicating the pencil sharpens to a fine point, for Franz Hardtmuth, who was responsible for technological improvements in the manufacture of pencils. Fact 31: Who invented the Pencil? In 1920 colored pencils were pioneered by the Faber-Castell company in Stein, Germany who used pigments, additives, and binding agents to produce a variety of pencil colors. Fact 32: Who invented the Pencil? Today, more than half of all pencils come from China and billion of pencils are sold every year. Who Invented the Pencil - Nicolas-Jacques Conte - Inventor - Invention - Definition - Meaning - Famous - Important - Pencil History - Pencil Timeline - Innovation - Significant - Pencil Development - Office Equipment - First - Definition - Kids - Facts - Information - Info - Who invented the Pencil - Dates - When - Why - Impact - Purpose - Use - New - Old - Amazing - Best - Definition - Meaning - Awesome - Cool - Pencil History - Timeline - Who Invented the Pencil?